But inspite of my little knowledge of German food, my stomach tells me that Brotzeit serves good German fare. The sausage platter was good. 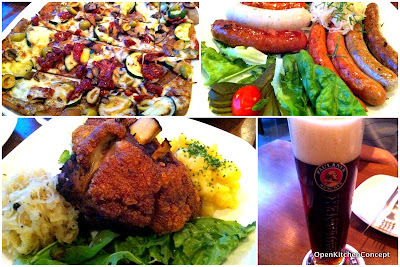 I really liked the sausages, especially the ones called Nürnberger. The pork knuckle looked very good. (I didn't eat much of it because I'm still adverse to pork in its rawest form after not eating it for more than a decade.) It sounded really crispy though, because you could hear even the next table crunching away. The sauerkraut was nice and sour and yet not too sour. And of course, the ice-cold beer washes everything down well. A nice place to visit, especially if you are very into meat. Everything looks delicious in the photos!